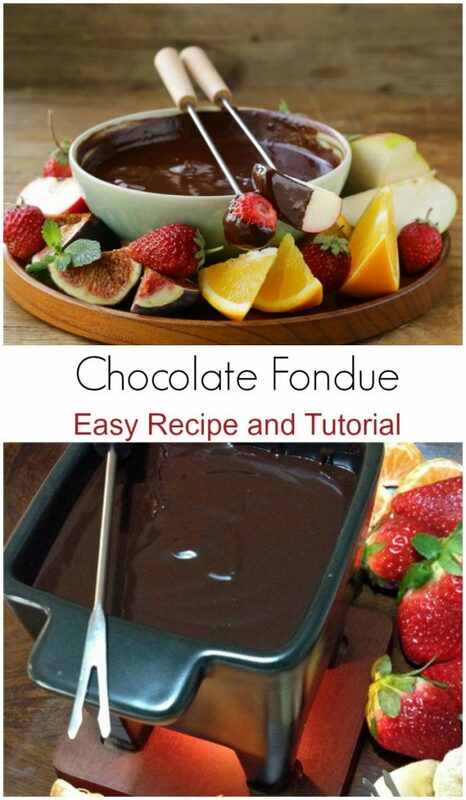 Home » Recipes » Desserts » Chocolate Fondue Recipe and Tutorial for Dessert Lovers! With Valentine’s Day fast approaching, I find myself craving all things chocolate! This Chocolate Fondue recipe seems like such an elegant dessert but it is incredibly simple to make. 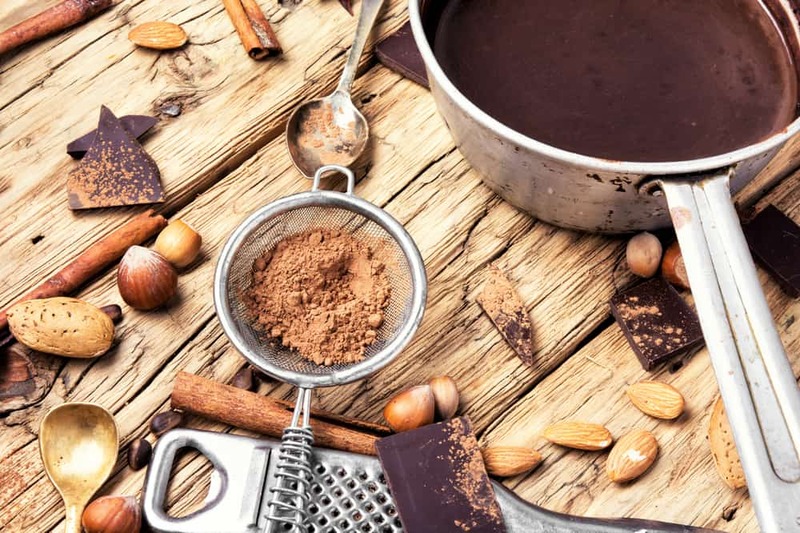 Depending on the type of supplies and kitchen equipment you have at home you can make this chocolate fondue over the stove or directly in a fondue pot. Regardless of how you make it, the key to really good chocolate fondue is high quality ingredients. Good chocolate fondue needs heavy cream and high quality chocolate. Everything else is pretty flexible! If you are looking for more chocolate dessert recipes, check out my bourbon ball recipe and my mint truffle recipe. First things first, chop your chocolate into small pieces to help it melt better. My preference is for Ghirardelli chocolate and I recommend a semi dark chocolate. Do not use chocolate chips. They have a lower percentage of cocoa butter and will not melt to a creamy consistency. If you have a high quality fondue pot that gets warm enough to actually melt the chocolate you can add the chocolate and cream into the pot directly. If you don’t (like me!) melt the chocolate and cream together in a double boiler first. Chocolate that is too thick will need more cream or a touch of evaporated milk. Do NOT add water or you will ruin your chocolate! I have my eye on the Cuisinart Fondue Pot but for now will have to make due with my double boiler. Add flavored liqueurs, peppermint oil, cinnamon, vanilla, cayenne pepper, ground espresso powder, peanut butter, fruit preserves, pureed fruit, 1/4 cup high quality bourbon. Get creative and add whatever flavor you think sounds good! I used about 1/4 good seedless raspberry preserves. Be cautious when adding alcohol. Too much may alter the consistency of the fondue. Try just a few TBSP. Most of the other additions are added to taste. What Should You Dip in Chocolate Fondue? Cut up your fruit. 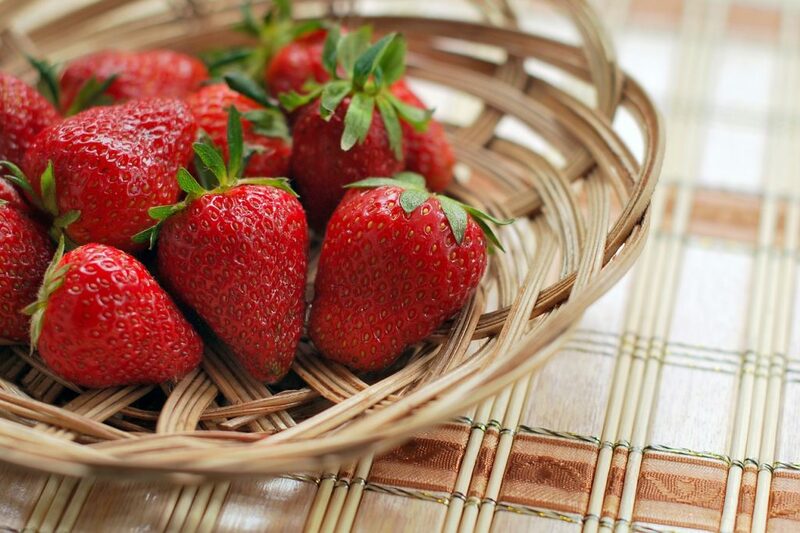 You can use anything from strawberries and bananas to something more exotic like star fruit and mangoes. Personally, when I think chocolate I think strawberries but I also love orange slices dipped in chocolate. What you serve is totally up to you. You can even serve your chocolate fondue with chunks of Angel Food Cake or Pound Cake. Get creative and serve whatever you enjoy eating with chocolate. Your kids would probably love marshmallows and graham crackers served with melted chocolate and that would make a fun birthday party activity or a rainy campfire alternative to S’mores! You can make chocolate dipped clementines for a deliciously easy snack as well. 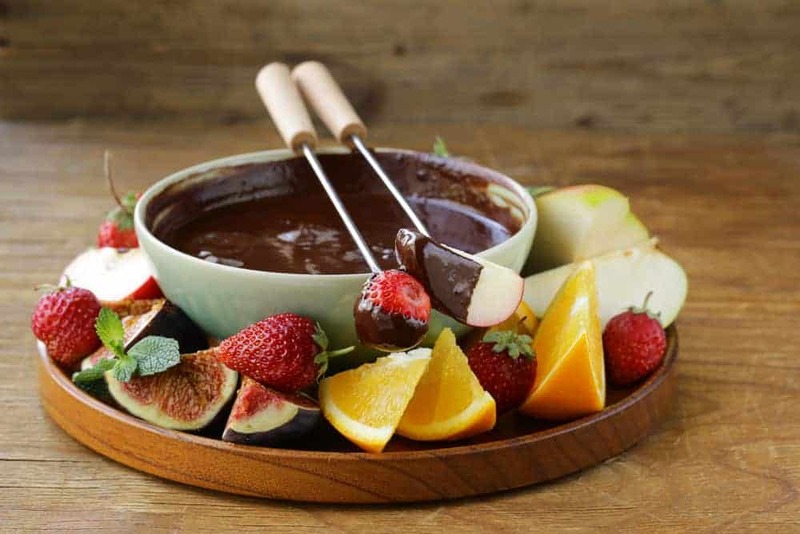 How to Serve Chocolate Fondue? 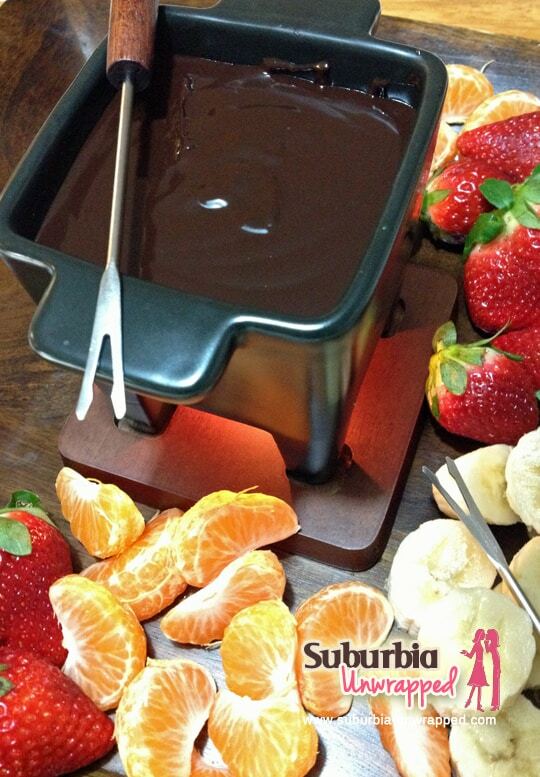 Serve your chocolate fondue! 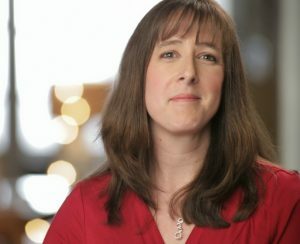 You can serve your guests (or just yourself!) with special fondue forks but you can also use bamboo skewers or even toothpicks if that is all you have. Chocolate Fondue is incredibly easy to make and a great way to celebrate a romantic evening with your significant other. Or, just encourage your kids to eat more fruit by letting them dip it in chocolate! In a double boiler, heat the whipping cream and chocolate over medium low heat. Stir frequently until chocolate is melted and mixture is smooth. Add in the raspberry jam and vanilla. Stir until mixed. Add the chocolate mixture to a fondue pot to stay warm. Serve with fruit or other desired bite sized foods. Like this Chocolate Fondue Recipe and Tutorial? Do you have to add the raspberry jam or can you just use chocolate, cream, and vanilla? you can just add the chocolate, cream and vanilla and it will be fine!